Next week Amazon Echo is coming to the UK. Will it bring artificial intelligence into our homes much sooner than expected? To tell us more about the continuing rise of Voice search and how you can adapt to it I will be chatting to Purna Virji – Senior Bing Ads PPC Training Manager at Microsoft. Who is using it and what for? What search engine does Alexa use? Is Voice search set to replace text search? Is Amazon Echo powered by Bing? Is it true that Voice search will affect primarily local SEO? What should we be doing now in order to prepare for Voice search in the future? Omi: What is Voice search and why is everybody talking about it and freaking at the same time? Purna: Firstly, people shouldn’t freak out about it. I think there’s a lot of amazing things about Voice search that we should look forward to. I just want to add that there have been a few really amazing people talking about Voice searches as well: Tom Anthony from Distilled is a really great voice on the subject. So let me talk about what is Voice search. It’s just a way of using a different interface to interact with the different search engines. You can use Alexa as you’re showing it right now or you can even interact regularly with the search engines directly. Instead of typing which sometimes can be troublesome if you’re doing something else like if you’re driving you shouldn’t really be typing on your phone but you may still need to find that information you need. It’s just a new additive layer or interface to talk to the search engines. It can also be done via digital personal assistants like Alexa that you have but she will use Bing to run searches as well. Traditionally it’s just like regular searches except it’s been activated via voice and in that way it differs. Omi: So Purna, tell us who is using it basically and what are the stats? Are people really using Voice search? I know many people we will have this one on their mobile device. I guess and I’ve seen the stats that a lot of people are buying this device (Amazon Echo) in America. So are people using Voice search? Purna: Very much so. Voice search is being adopted at really increasingly rapid rates. If we look at the stats and even just about a year and a half ago we still found that about forty percent of people above 55 were using Voice search and a much larger percentage closer to sixty-eight percent of people are under 34 were really using Voice search a lot. This study didn’t look at 18 and below but if you think about it now if we look at the people who were born using the voice or are familiar with it like my son who’s almost ten and he uses Voice search almost all the time – it’s just easier it’s familiar – and so we see a large percentage of people already started using it like at the start of 2014. Since then much that the use cases have gone up. MindMeld did a study at the end of 2015 and they found that since the summer of last year about forty-two percent of people have just started using voice and I think that’s the stats somewhere is now about forty-one percent of people on average across the board use Voice search regularly. Omi: So from what you are saying is it true that Voice search is basically replacing the normal way we are interacting with our devices? For example, instead of typing on my phone I can just say “okay show me the nearest restaurant”. Do you think that Voice search will replace completely text search? Purna: I don’t think it will replace it completely. I think it is going to take a lot of the time when the traditional uses where we would have had to use text to use voice. So certainly it will take some of the share. But think about as new technology comes on. Like we had our computers before then we got desktop laptops then we got mobile then we got apps right? When you have your mobile you still use your desktop. Now we have apps but we still sometimes go back and use our desktops to do a traditional search. So we’re just adding on new ways to interact and voice search may steal some market share but it never replaces traditional search completely. You will still use the old one. Omi: So the next question then would be is this device, Alexa, powered by Bing? Maybe we should ask Alexa first. Alexa, do you use Bing? Alexa: You can ask me a question and if I don’t know the answer I will perform a Bing search in the Alexa App. Purna: Alexa is an open platform but all of her searches anytime she needs to do a search she will use Bing. It’s the same thing with both Siri and Spotlight for Apple. Siri will use Bing as her default search engine. Omi: Many people actually don’t know about Siri powering Apple. How comes? Is this like a secret of the trade? Purna: It’s certainly not a secret. It’s just that it’s not like shouted out from the rooftops. We’re very open about it telling everybody that yes it’s powered by Bing. Most people don’t notice but if you say ‘where is my nearest restaurant’ she’ll do a search and give it to you but there will be a sentence that says that it is power searched by Bing but I think people just don’t read it because you only look at the searches. But once you notice it you will always notice it. Omi: So the next question – and all my friends were asking me the same thing when I told them that I would be talking to Purna Virji – how on earth is this thing recognising my voice. Do you use an artificial intelligence of a kind of something like that? Purna: Absolutely. So all these digital personal assistants Siri, Cortana even Google (OK Google) are all powered on the back end by artificial intelligence and machine learning. She’s (Alexa) trying to essentially build a relationship with you. She wants to get to know you better so she can serve you better. Omi: I have noticed that in the beginning, it (Amazon Alexa) was struggling with my accent a little bit. But somehow nowadays even if I make a mistake grammatical or whatever it will still understand me which is amazing. Purna: She will and that’s also a lot to do with the error rates in the technology. It used to be pretty high before like twenty-five percent two-and-a-half years ago. Now it’s less than eight across the board and Microsoft just had a breakthrough at 6.3 percent which is very very low. Omi: Because you mention mistakes and errors the next question naturally is: is this device (Amazon Echo) connected to your servers? Many people are freaking out – especially with the arrival of Alexa in England – because they think that if this device is constantly on than companies like Microsoft can tap into their private conversations? Purna: I don’t know and I can’t comment on what Alexa does because I just don’t know the technology behind. Does she listen all the time does she not. I don’t know enough to comment on that. It wouldn’t be my place to say that. But I don’t think people should be really worrying. l would assume that the big companies have built-in safeguards and everything to respect privacy. And I believe when you sign up there’s all the terms and conditions they explained it greatly. Now I don’t read all the terms and conditions in detail because really who does that? We’re just like check the box I want to go and use my device but I’m sure the answers are in there somewhere. Omi: Of course you’ve answered my question but what I really wanted to know is: if I ask Siri or Alexa a question how do you know if I’m served the right answer, in a way how do you know the percentage of errors? Purna: So basically everything gets saved in your account. You’ve probably noticed that you can go to Google and look at your list of queries. You can look at Alexa’s app on your phone and you will have a list of everything you’ve asked her. They do save it and because you’re signed in into your account she gets to know you better. The only goal of the digital personal assistant is to serve you and to make life more and more convenient for you. It is in its interests to get to know you better. So it will know if you’ve signed in with your Microsoft account, for example, it knows that you tend to search for particular types of things on Bing. So if you are looking for Java then Omi’s been planning a trip to Indonesia and he’s really not looking for the software. So she will understand you better. So if you say ‘I need some info on Java right now she’ll give you the country. Omi: OK, so is it more like machine learning rather than artificial intelligence then? Purna: It is both. Because if you think she’s got IQ she’s also got some level of EQ (Emotional quotient). Maybe you’ve noticed she’s got the personality and she will show it to you. Omi: This was actually my next question. And I am so happy you’ve mentioned it. What about personality? Do you think that with time this device will actually develop a personality talking to me? Purna: She already does have a personality and that’s an interesting question that the different companies are going to look at. In a way how much personality does your digital personal assistant need? So if I’m the conversation bot from your ATM machine at the bank she probably doesn’t need to have much personality. She is just telling you: do you want to check your balance, do you want a receipt or do you want to withdraw money. But somebody like Alexa or Siri if you talk to them for a little while you’ll notice that they have a personality. They are engaging. I’ll tell you this one simple example. My son will ask both Siri and Alexa to tell him jokes and then if he doesn’t like the jokes sometimes he’ll be like ‘that was stupid’. So Alexa will say “Oh I’m sorry I’ll do better next time’’. She would be very humble and she would be like “I’m sorry”. On the other side, Siri will yell at my son it would be like “that’s not very nice”. Omi: You’ve just reminded me that I can ask this device to tell me a joke. Alex, tells us a joke. “Q: What did one eye say to the other eye? Purna: Speaking of the personality like that’s also something that they’re gonna want you to the need for personality so that you continue to engage with her. There is a difference when you call customer support of a company or if you go into a store and they make you feel welcome. You’d rather talk to somebody that makes you feel welcome and you can relate to. Compare this to banks where it will be more like :ok, here’s your money and now you can go”. Devices like Alexa need to have a personality so you can engage with her more and she can continue to be more widely adopted. Omi: Good, so on Monday I can tell all my friends that this thing would be “different to me and different to you”. Purna: Maybe not that different but she should know what you like so I think she might tell you different kind of jokes or different kinds but her core personality will be the same. It’s like you would relate to maybe your boss slightly differently than you would relate to your friend but who you are is the same. Omi: You’ve touched a very sensitive spot! Purna: Sorry I didn’t know. Omi: No, I’m just joking honestly. So let me ask you the next question: How will Voice search affect SEO? And probably this is the question that a lot of people are asking. Purna: I think it will impact SEO but in a couple of different ways. The first is just the way we search using voice tend to be different than the way we search using traditional text. So it is just your natural language type queries. It’s more action oriented, it’s more local oriented, so what we search for using voice and what we expect is different than a traditional text, so that’s one side. The other side is how the search engines and how it will impact your branding. So very recently at SMX last week, I was on a panel of voice search and my fellow panelist Jane Slag who runs the SEM polls and talks very closely to people both at Bing as well as at Google and she was mentioning something about Google showing more snippets and more rich snippets when you do the voice search then you do the text search. Her research shows that rich snippets show over 43% of the time for text searches. So that was interesting and also like Cortana doesn’t do this yet even though she’ll read answers to you if you ask her. When it comes to the Google App if you say something like “How do I make a paper plane?” it will say “according to XYZ website, this is what you need to do.” So she’ll mention the brand name which is interesting. Cortana won’t do it. We read out the answer but we won’t credit the sources visually. So that’s the second level is how the search engines will serve your results differently. If there is going to be fewer results showing up as with voice search you don’t get to see as many. How do you make sure with that? How do we make sure we are optimising so that we do show up when people are using voice in general and how the search engine showing us now and how can we expect people to buy from us and use voice? So it’s much more convoluted than a simple like put this natural language keyword here and it will be ok. It’s more about overall action. Omi: So because we are talking about SEO, my next question will be (and a lot of my SEO fellows or friends are asking me), is it true that voice search will primarily affect local SEO? For example: “where is the nearest restaurant? Can I buy something from the nearest Tesco?” Or is it going to affect the SEO as a whole? Those type of question and answers, so you have a lot of the FAQ content on your site optimised, different stages of the funnel content, you should pay attention to that coz it will surface a lot more via voice. Omi: Are you basically saying that in a way, we have to concentrate even more on delivering the right content. Recently I’ve been talking a lot about RankBrain. It has a similar approach to search like Voice search. We have to concentrate on branding, more content and then schema (markup). Are you saying that we have to produce even more laser focused content in order to satisfy Voice search? Purna: It’s sort of a yes or no type of question. I know I’m sorry I hate it when the search engines are like “it depends”. Omi: It’s a bit confusing for us the traditional SEO’s to understand how those things are going to affect our jobs and, basically our businesses. Purna: Right and it’s a valid question to ask, but certainly it’s not gonna be too scary. The good thing is a lot of what you are doing already, like a lot of what we are doing already as SEO’s is very good and helpful for voice. Like, make sure you are following all the best practices like making sure you’ve got schema everywhere. Remember voice search needs a lot more practice; the more you talk to it, the better it’s going to get. So if I give it more information and I’m more helpful to the machine then the machine can just learn about me better and faster. So if you aren’t doing schema which you should have been doing anyway, and you are directly doing it now. Omi: Listen to Purna, people. Schema. Purna: Make sure your citations are absolutely perfect, your phone numbers are correct, your address is correct, your hours are correct. You don’t want to give people bad experiences coz we are seeing now ,Omi, and you’ve noticed this as well, we are seeing this huge rise in searches where people will just look at the SERP and they won’t click through to the website but all the information that they need is what they got. I may just want to find my number from my local B&Q or I just might want to check how late Sainsbury’s is open. Omi: Strangely enough, this thing (Alexa) can recognise your voice through the speakers better than mine. Purna: What I found is when the commercial for Amazon Echo comes on my TV and they‘ll be like “Alexa do this” my Alexa will wake up and do that. So if they say “Alexa tell us the news”, my Alexa would talk. And I’m like shhh, she wasn’t talking to you. They are pretty sensitive because they’ve got good speakers. I would say Omi, we should look at voice search as a different discipline. If you are thinking about Alexa and the Echo, you should think of her very differently than if you are thinking about Google Now or Cortana or Siri because they have different interactions. Alexa is only audible – you can only talk to her you can only go back and forth vocally. On Google Now and Cortana, there is a visual interface as well. Let’s talk about Google Now and Cortana: yes rich snippets your branding, your question keywords all your content marketing would show up, it would be good. If you are looking at something like Alexa, you are only captive by what she can tell you and for her, you have to start thinking about your funnels and your transactions and your forms. I will have those conversations but I won’t get to see anything else. There will be no chance to say like the Telegraph to post their ads or something else on the screen. It doesn’t apply. And that is interesting. So with those different disciplines, we will have to optimise differently for each. Omi: This leads me to the next question basically, and this is something that a lot of SEOs are talking about. If I ask Alex a question, it will give me only one answer. So basically there are no SERPs. With more devices like this coming in the future if I ask a question there is only one single answer. There is no number 2 or 3 or whatever. If I go on to my mobile I’ve got a choice. So what are the new SERPs, because if we understand what the new SERPs are then we will know how to optimise for them. Purna: I think this is going to be the biggest question. Omi: Sorry I know the question is a bit strange. Omi: Traditional SEOs always talk about the SERPs. There is position 1, 2, and 3. But with this thing (Amazon Echo) and with many other similar devices coming there is only one choice. You know in a way, we are even limited. To be honest we are limited because the answer I get here I may not like or may not be the best answer for me. Am I right? Purna: Yes look that is the biggest question on the table today. Now you know who is the gatekeeper. The digital personal assistance is the gatekeeper between us advertisers and between the audience. There is a new layer that is coming behind so we need to go and appeal to this. Let’s take a step back and understand why there is this barrier and why they are showing fewer things for you and that will sort of answer a little bit more of what we should do. Omi: We have to understand (the process) so we can adjust in the future. Purna: Yes exactly. We have to adjust because we just going to have to play up more and more relevancy in order to get past this gatekeeper. What’s happening now is we have always seen this tradition in the SERPs when the web first came out there was like a million directories. So you look for your local plumber and there was like 5 million result and we thought that was awesome. We thought that was a really good thing. The search engine is so clever it knows 5 million results for my local plumber. Omi: I’ve just remembered something: a big choice is not a choice. Purna: It’s not a choice and this was why this was so frustrating. And then it became more like vertical search. And it became like the richer searches where we have images and videos and now we are going more like entities and action based and search is also going to different places so they understand us better. So now we can search on our phones, we can search on our cars, we can search on a device like Alexa. They get to know us better and this gives the search engine ultimately far more intelligence. We know you better we can identify more patterns and the good about just richer and more data’s that you can start to see different patterns and get more predictive analytics from it. So now we are reaching the point where we are trying to know you better. It’s like now I know Omi really well and he doesn’t like Greek food very much and I know he doesn’t like very spicy food for example. Omi: Basically I don’t like spicy food. I don’t like it at all. Purna: Oh you see I predicted it. Omi: I hope it’s not connected to the Alexa. Purna: It was just a guess. If you are walking around Chinatown in San Francisco and there are some really good restaurant but some of it has spicy food and you are hungry and you ask Siri, Google or Cortana it would know you enough to say: let’s not give Omi this restaurant and let’s just find him like a good Greek restaurant. Or Omi has eaten Greek food like four times this week he is probably not going to want it again now. So maybe today you want to try an Italian restaurant for example. She will predict that. You are going to fewer choices. Before if you said “show me restaurants around me” she would have shown you may be like the 15 restaurants around you. But that’s not the case anymore. She knows you now and she will show you the restaurant that she thinks you’ll like. So it’s getting more and more personalised. That’s even fewer results and that’s going to be the problem for you and me sitting at home advertising to our audiences. We are going to each find that one spot of relevancy. So we may show up less often, but when we do it’s going to be far more effective. And this is the question that we are all trying to deal with now. If I know that I only drink coffee from Costa then Starbucks will be “How do I get Purna to come to my store instead of going to Costa’s”. Those are going to be conundrums that we are all trying to figure out how do we get through the gatekeeper. Omi: Because you mentioned advertising and because I’m just trying to bring up the subject of PPC the next question is: what’s going to happen with our advertising? How are we going to advertise on devices like Amazon Echo? Purna: So that’s where I would say I would look at something like Echo more as a purchase funnel alternative as opposed to searching. Because if you think about how much time you’re going to use the Alexa and the Echo she’s great. She’s also similar to your desktop which is more like a stationary device. She sits in one place in your house or if you have multiple (devices) she sits in one place. Where will you use voice search far more often? Will be on your mobile phone – technology that is always with you. How often are you more than three feet away from your phone? That’s what we should be thinking about. When it comes to Alexa I would think about her more from a purchase funnel standpoint. She has skills is what they call it. Like Domino’s (pizza) creates a skilful Alexa so you can say (I’m not going to name it) but “Echo go and order me a pizza and have it delivered now” and she’ll know what you like. Or her Amazon has, of course, a major scale and interaction with her where you can tell her “hey, go and find me like the cheapest box of pens that have five-star reviews and send them to my house” and she can understand that. Or Kayak so with the problem that’s going to be coming up is going to be not about serving ads on her which of course is going to be a case “do we want audible ads or how do we cut through?” It’s more going to be the case of how do I just transfer my purchase funnel and make it ready for her. Whereas what we’re gonna have to think about in terms of ads and all that is going to be on the SERPs. With Google, if you have an Android you can just do voice search from the homepage. I have the Google App or I have the Cortana App on my iPhone and I can just go to the app and I can do a voice search. Using the visual interface I’ll still see results. And that’s why I will still see my ads. So for PPC I think it’s going to be – if I was to personally guess I don’t have any indication from anybody higher up at Microsoft to tell me this – but my personal guess based on what I’m seeing is that probably shopping campaigns like visual is going to be first or local.It’s gonna be one of these two that we’re going to see the ads in there first. That is where your PPC team should pay attention. Omi: I understand what you’re saying. It makes a lot of sense. What my colleague has asked me was – and it’s a valid question – are we going to be able to bet on answers. This is exactly what PPC people do, right? Purna: Yes, of course, it is going to be exactly what people can do. I would say we should do baby steps because that’s what we’re seeing even with voice search and digital personal assistants that were being eased into it. Certainly, artificial intelligence is something that a lot of big companies are banking on. If you saw the news lately you can see that Microsoft formed a new 5,000 person AI team essentially and it’s a big goal of Satya Nadella that he’s announced that we’re gonna tie AI into everything because it’s so powerful. So yes it would be interesting to see what happens with the Alexa. I think for PPC right now, I don’t know to be perfectly honest what can we do with Alexa. But I know that for the near future right now you should be paying attention to product listing ads. You should be paying attention to local ads, where the visual and vocal connection is very strong. You should be tying your ads to what we see people using voice search for right now. If you see what people are using it for right now, it’s for things like local; it’s when they are second screening. Like driving is the number one use of voice search that we’ve heard from Google. We’ve seen the indications of that here as well. We see it when people are busy and they can’t type, they tend to look for “how do I get here?” or how do I do this?”. Or maybe entertainments, like “what’s a good movie” or “who’s that actor”, things like that. It’s going more and more and we’ll start searching for “I need to buy this pair of shoes with high heels that are like this, from this brand”. In that case, the visual ads would be the perfect accompaniment. So if you can serve product listing ads, that would be excellent; if not focus on just local or surfing your content. SEO and PPC can get married here very well. Purna: So we get all of your content, the higher funnel content like “what’s the best way to deep clean my car?”. And then if you are like a car cleaning service, you would probably have content around this. So you can just maybe spend 50 pounds and run PPC ads for a long time, it’s not competitive, it would be cheap, you can still do things like that to promote coz you will come up with the higher funnel queries right now. Omi: Ok I get it. So to summarise the whole conversation and this would be my last question. What should we be doing now in order to prepare for voice search in the future? Kind of to summarise everything that we’ve said today. Shall we concentrate on content or the technical SEO like we said or schema or stuff like that? What’s the secret to winning the SEPRs in the future? Purna: It’s actually really simple because there is no competition, no one’s monetizing it right now, you are in a very good place to start now and I would highly recommend you start now. Let’s talk about just some easy steps. Step one. Just to see how people interact with you using voice. You can do this either by asking you PPC team to give your search query report, or you can look at Bing Webmaster Tools or Google Search Console and find a list of keywords. Try to the sort them by what looks like the longer tail. What looks like it’s a question keyword. If it says “Hey Siri” or “OK Google”, you know for sure it’s voice because that’s initiating voice. But if it doesn’t and there is no clear analytic, try it on voice but if you can find something that’s more than like four keywords usually longer than that like four words and it’s a question, it’s quite likely that it came from voice maybe. So go and see what are people using voice for to search for you. And I look at a lot of different plans, a lot of different accounts, I see some people have it a lot and some people don’t. Omi: So a quick question here… what’s really the most searched thing? Is it really “something near me”? Purna: “Near me” is a lot but it’s not always the most and it varies by industry. Omi: Coz a lot of people when I talk about voice search are telling me I’m not in the industry where people would ask about my business with the question “near me”. And I’m saying I’m not sure this is really the most asked question, I don’t know really. Purna: It’s high on the list but it’s not the only thing. I would say any businesses needs to be thinking about voice search and optimisation for voice search right now. Even if you do something B2B, if you are a medical device company, you should also be thinking about it because people are going to be researching you. So think about higher in the funnel queries, the more you can capture attention early on, you can keep them within your funnel and try to earn them. AII’ve seen really great examples of home improvement companies that you can say “give me cheap kitchen renovation ideas that I can do for like under a thousand dollars” and there are companies that have served ads. You will talk this right? It’s easier to talk than type. I can talk 150 words per minute whereas I can type about 40. So you will say this, and if your content can show up either as SEO or as a PPC ad, to up your chances, you’re in. You can keep somebody then they go to your website then you can then pull them down to you conversion panel. So that’s why it’s important to know what are people using you for. The second step run and do all your schema, run and get your technical site set up, coz that’s good for you. Omi: You can call me people. Purna: Anyway, you can call Omi. Omi is one of the best technical SEO’s in the whole world, and I can truly vouch for that. So yeah, talk to Omi for any technical SEO questions. Make sure your citations are diverse if you have. The third step is to go and do some keyword research, now I know the sort of intent people are coming from. Omi: Can I just stop you here for a second? Because for the second time, you’ve mentioned citations. Are they really that important? Purna: They are that important because people tend to just go and look and they may not even click through save all the information that people are seeing is on your citation and they don’t have a chance to go to your website to find the address, and then yes it going to be really important. Make sure your address is fine, the phone number is correct, hours are correct. I’ll give you an example. It was Easter weekend, my mum and I wanted to go shopping, and we said okay is any store open? So I did a search for a large retailer here and I asked is he open? And he said yes open until 9am to 9pm so I’m like fabulous. We went. It was closed. It was so frustrating, when I went out, I was like “I’m not going to this stupid store again”. I was so annoyed. And so we looked up another store.Yes, Easter hours, we are only open till 5 but we are open today. So that was good. That was helpful. Reviews are also really important especially If you are local. Make sure that reviews are what people see first and they may not click anymore to give you more chance to explain. The first impression is all that is going to matter. So yes even if you are not a local business, sometimes citations just seem, just your reviews online are important. The third one is: think about the intent and look at only a couple of different places. We’ve seen examples of companies that we’ve consulted with and who’ve started optimising for voice and the results that they’ve seen are lift in traffic and then engagements when they’ve optimised. So the question is always where do I start? And it’s not that difficult. It’s like prioritise from your top 2 or 3 most profitable keywords – start from that – and look at the longer tail versions that could be most relevant to it. So rather than say Bahamas vacations, “what’s the best family vacation deal for the Bahamas?”. That’s probably a good keyword longer tail that could be on voice search right? Bahamas vacations might be your number one keyword but like “what’s the best family vacation deal for the Bahamas?” is a really good voice search keyword. It gives you so much more information than just Bahamas vacation. It tells you that they are looking for a deal. It tells you that they are family and they probably have immediate purchase intent. So try to look at those type of queries and then you can think about how do I best optimise, do I have a page that answers that question? Do I have a page that talks about this family vacations? Do I have enough supporting content? And that’s all it is. It’s like think about the intent and the right actions that they are likely to take and optimise just for that. Omi: Oh my god this is like a content SEO lesson. Purna: It’s simple but you do this already which keeps me more excited. Honestly, this is the first discipline where I think the PPC folks have to work harder than the SEO folks to optimise for voice. The good news is SEOs are all smart and they’ve already done a lot of these lessons whereas PPC’s we going have to be like “now I’m going to have to create this campaign, now I’m going to do this, now I’m going to think of that”. So you have an advantage so celebrate for once. Omi: Yes, yes. It’s good to hear to be honest with you. It’s really good here something like this on a Saturday afternoon. As I told you earlier last night I went to bed at 2 O’clock, I am that busy (doing SEO optimisation) so it’s good to hear that it may pay off in the future. Purna: It will. Just the fact that the intent is so clear is going to make your life a lot easier. Omi: Yes. Thank you very much Purna. You gave me so much information that probably I had to come back to this and write down everything. So we shouldn’t be freaking out basically because this is how we started this conversation. Voice search is something that is just going to improve the customer experience. Am I right or wrong? Purna: It is definitely just going to improve the customer experience. If we think about the mobile, before we had the desktop then we had the mobile, then we started getting apps and then remember everyone freak out like “oh my God, what shall I do about my app”, everybody go and write your own app. And now we are going to have like bots and conversations and it’s not that scary. We’ve done it before. We found a way to make it work every time. Voice search is even better because it’s giving us all of this intent and this insight into personalization so it’s not scary, it is exciting and as long as we start now when there is no pressure, we’ll figure things out as we go along and it will be very good. Omi: Good to hear. So sadly we are coming to the end of my first interview with Purna. My first interview ever basically. Thank you so much for coming. Let’s her Alexa again before we go. Alexa, tell us a joke. “I had a really great boomerang joke. Omi: Have you notice. She is so polite. Purna:She’s very polite, unlike Siri. Siri is very nice, but she’s got a personality. Omi: Thank you very much Purna. I’ll definitely see you next year at BrightonSEO. Guys, thank you very much for joining us and basically keep it real. Voice search is coming. 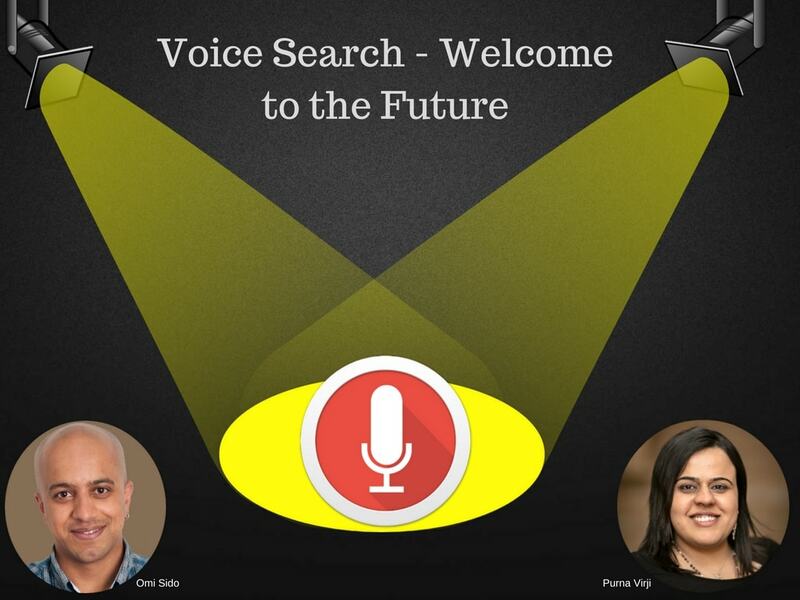 Purna Virji is a speaker and columnist on Voice search, PPC, SEO and Content Marketing. For well over a decade Purna has been living, breathing and dreaming PPC and SEO. She regularly speaks at digital marketing conferences across the globe such as MozCon and SMX Advanced and is a columnist for Search Engine Land and Search Engine Watch. An award-winning former journalist, Purna was the CEO of Purview Marketing prior to joining the Bing Ads team. In her spare time, she’s an avid traveller, aspiring top chef and amateur knitter. Say hello @purnavirji.